The article describes one way of writing Ge'ez script (Amharic, Tigrinya etc) in latex documents for Ubuntu users. This method uses XeLaTeX engine which handles non-roman scripts and fontspec package for loading the required fonts. The steps are tested on Ubuntu 16.04 LTS (Xenial). to install fonts, unzip downloaded ZIP folder and double click the AbyssinicaSIL-R.ttf file. English text: May peace be with you . A PDF file with the same file name (filename.pdf) will be generated, open it using your PDF reader and check whether the ge'ez script is correctly rendered. 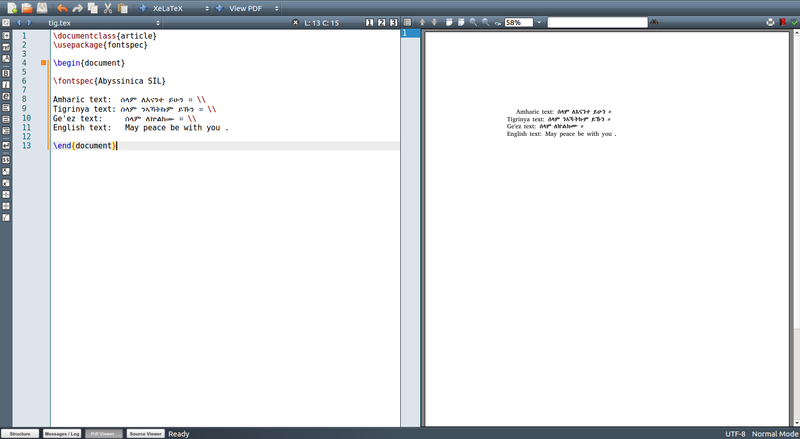 The following screenshot is from texmaker ( a latex editor).